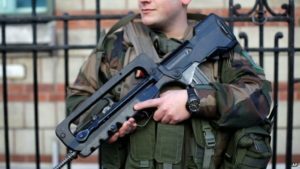 PARIS — Imagine for a moment arriving at Sunday morning religious service only to see the doors of the church guarded by camouflage-clad soldiers with automatic weapons. Well, this was the stark reality when we arrived at our neighborhood church, a structure dating from the 15th century, but hardly a tourist nexus. Indeed this was a necessary security precaution being taken across France, at synagogues and mosques too, for worshippers in the wake of Islamic State of Iraq and Levant’s barbarous murder of a Catholic priest celebrating mass. Security is tight at the Catholic shrine of Lourdes where special police and military units are protecting the pilgrimages leading up to the Aug. 15 church feast. During a summer when Islamic jihadi fanatics used a truck to ram and kill 85 civilians in Nice, and others carried out shootings and a suicide-bombing in Germany, the violence reached its sanguinary apotheosis in the sacrilegious crime of killing of an elderly priest, Jacques Hamel, while he was saying Mass near Rouen. The terror has lingered since jihadi militants carried out the bloody Paris attacks last November. France remains on edge but stoically sanguine. To be sure the terrorist threat facing France is tragically cyclical as it is rooted in the shifting patterns of causes, ideologies and motivations. In the early 1960’s towards the end of the Algerian crisis, France endured a spate of violence. The 1970’s saw the Palestinian issue spill over into Europe; by the 1990’s Islamic fundamentalists with Algerian connections carried out the infamous RER train bombing in St. Michel station. Today we see the Middle East in chaos with Syria as the epicenter and the symbol for terrorist recruitment, motivation and violence. Thousands of European “foreign fighters,” many of them French and Belgian born Muslims, have flocked to fight in the jihad in Syria. The principal danger comes from those returning to Europe with both the military skills and the elixir of hate with forms the key security threat in France and elsewhere in Europe. Indeed, the brutal Syrian civil war churns on with its physical and psychological carnage which extends beyond the besieged city of Aleppo and the environs of ancient Damascus. Until Syria’s bleeding can be stopped and healed there is a key motivator for violence which has a way of then returning to the cities of Europe and later the USA. And what about Libya or Iraq for that matter? Can we be certain the waves of migrants fleeing war, over a million of whom have gone to Germany alone, will not bring the hatreds and mores of the Middle East to their new places of refuge? France’s Socialist President Francois Hollande, much like Barack Obama, while treating the symptoms of violence, still really refuse to admit the dangerous depth and source of the radical Islamist problem inside their countries. So in this Summer of 2016, strange memories return. A sense of déjà vu if you wish. As a young boy on my first visit here in June 1962 on the eve of Algerian independence, I vividly recall the odd thrill of seeing soldiers in the streets of Paris and viewing the massive base legs of the Eiffel Tower surrounded in webs of barbed wire. That was so long ago I thought, but as if in a nightmare, the images have returned.